J.Blunden: Mongolia is not a country to visit in a hurry. Jane Blunden, Mongolian expert, one of the first Irish travellers fell in love with Mongolia over thirty years ago when travelling in her 20s. She is an author of “Mongolia travel guide“ and her book has been published in third edition in 2014. She wrote “…such travel to a far-off country both brings us home and teaches us about ourselves revealing, perhaps, our true identities and, maybe, our deepest desires and greatest fears…” The guide reviews new hotels and restaurants which are popping up as business is booming. Mongolia provides all the information you’ll need to arrange an unforgettable stay with Mongolian nomads, enjoying the centuries-old lifestyle of a traditional Mongolian house – Ger. 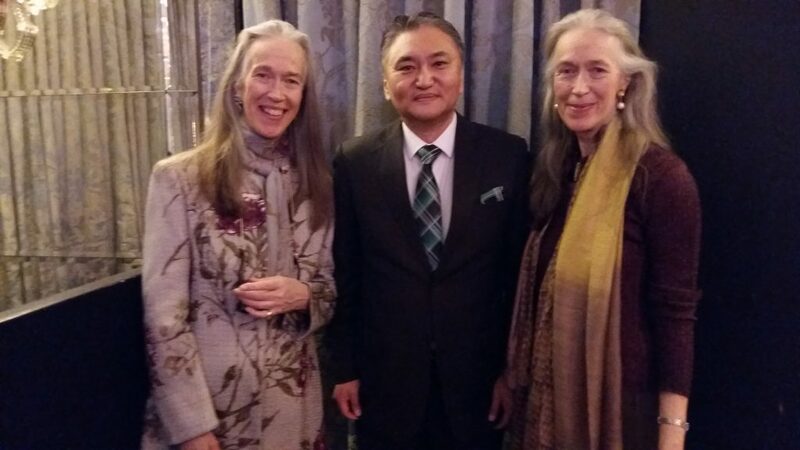 Mr Odonjil Banzragch, Minister-Сounsellor of Mongolian Embassy in London, J.Blunden and her sister C.Blunden are looking to further enhance bilateral relations through cultural, humanitarian cooperation between the two countries. (Source: CNN.COM) Help has arrived for travelers who’ve resolved to avoid spending their tourism cash in countries with poor human rights and environmental records. Non-profit group Ethical Traveler — a project of the Berkeley-based Earth Island Institute — has just released its annual list of the 10 most forward-thinking countries in the developing world. According to the California-based group, each country is reviewed for its performance in the areas of human rights, social welfare, animal welfare and environmental protection. At the same time, it also needs to have plenty of appeal as a travel destination. Five first-timers have made this year’s list — Grenada, Micronesia, Mongolia, Panama and Tuvalu. “By spending travel dollars in forward-thinking countries, explorers can reward the good guys — and encourage humane practices worldwide,” says Ethical Traveler’s report. “There are seven island nations on the 2016 list, marking a continuing trend in the winners’ circle,” says the report. Mongolia’s inclusion is also significant, as it’s the first developing mainland Asian country to ever appear on the list. “While we acknowledge that no country is perfect, we honor those that strive to build a better, more sustainable society,” says Ethical Traveler co-founder and travel author Jeff Greenwald. Creative Curating, the Embassy of Mongolia and Cultural Envoy of Mongolia Mrs Unurmaa Janchiv, will present Mongolian artists and their paintings at the 4th edition of the Oxford International Art Fair taking place on 24th, 25th and 26th February 2017 in city of Oxford, UK. We cordially invite you to visit us at Stand OL18 and vote for us. 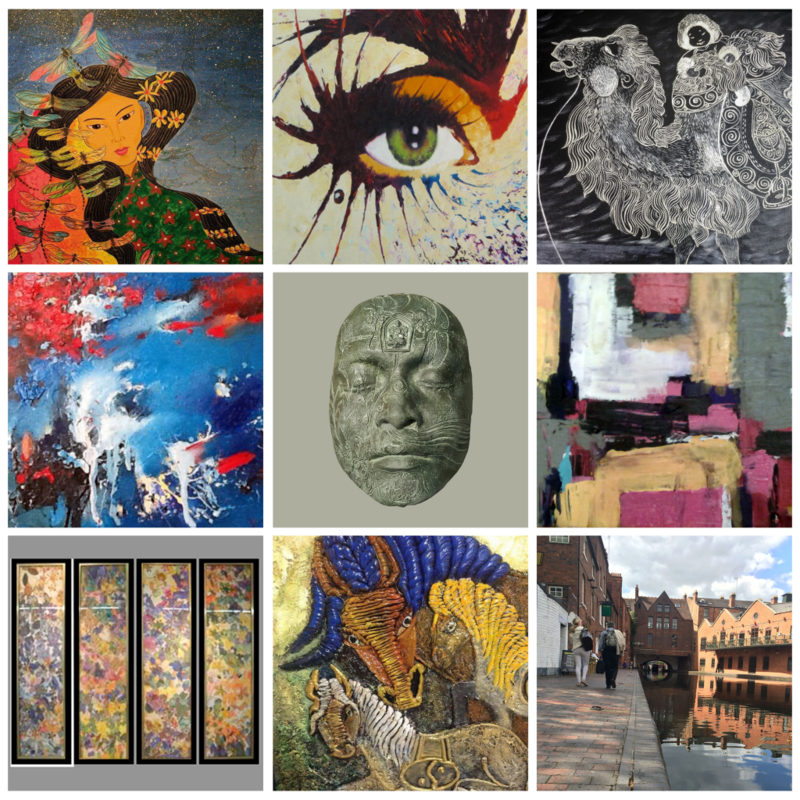 A rich mix of talented artists from over 30 countries display their artworks at this annual Art Fair, attracting over 6000 visitors every year. This year’s highlight will be an original artwork by the British contemporary artist Damien Hirst, to be displayed by InVogue Art Gallery. Sunday 26th Feb 11.00-18.00 FREE ENTRY prebook online. Ulaanbaatar /MONTSAME/ Parliament Speaker M.Enkhbold received Catherine Arnold, Ambassador Extraordinary and Plenipotentiary of the United Kingdom to Mongolia on February 1. At the beginning of the meeting, the Parliament Speaker, M.Enkhbold remarked that “Mongolia and the United Kingdom have a long history of cooperation as the latter is the first western country to establish diplomatic relations with Mongolia”. Emphasizing that the high-level reciprocal visits becomes more regular, the relations between the legislative bodies of the two countries have started developing more consistently, the Parliament Speaker said “Cooperation between the parliaments is crucial in creating more favorable legal environment to resolve the pressing issues of the economy, trade and investment”. After confirming the invitation for John Bercow, Speaker of the House of Commons to visit Mongolia, the Parliament Speaker has a willingness to expand the mutually beneficial relations with the UK by reassuring the cooperation of the two countries in education, military, mining, energy and information sectors. In response to the Parliament Speaker, Ambassador Catherine Arnold expressed her gratitude towards the Speaker for the meeting and a wish to expand bilateral relations. Catherine Arnold continued “It is possible to broaden the scope of the educational programs, in particular, by improving the English language knowledge of public servants through consecutive trainings. We are capable of enhancing potentials of universities through co-projects and technical supports. Recently, the National University of Mongolia has started cooperating with two UK universities, which laid the groundwork of an effective relations in this area. Also, we’re working with the Asian Development Bank on renewable energy project to improve energy supplies in the western region of Mongolia. As for the railroad industry, “Pandrol” company of UK has started manufacturing railway fixtures and ties. “As UK investors are interested in Mongolia, more information and promotion about Mongolia should be available. We’re planning to organize investment-related meeting or forum by sometime this spring in Mongolia. And just a few days ago, the mining representatives from Britain attended the Oyu Tolgoi Supplier Forum and signed a memorandum of cooperation with the Ministry of Mining and Heavy Industry of Mongolia” remarked the Ambassador.